Highlight Due Dates in Excel - How to highlight items due, overdue and completed in Excel? The item can be an invoice, a to do activity, a project or anything. Lets say you work at Awesome inc. and you have list of to-do items as shown below. As you can guess, highlighting the due items is easier than actually doing them. First lets look at the solution and then learn why it works. And set font color to dull gray from formatting button. And set fill color to orange. And set fill color to red & font color to white. Now, the items will be highlighted based on the current date (TODAY) and change colors as you make progress. At this point you may have 2 burning questions. How the heck am I supposed to ship 100 units of smile. Lets talk about the solution & understand why it works. We have 3 conditions in our highlight table (shown above). If not done & due in next 7 days show in orange color fill. The first condition is easy to check. We just see if a todo item is completed and then highlight the whole row dull gray color. So we write =$D6=”Yes” as the condition. We use $D6 (not D6) because we want Excel to look at column D (completed?) even when we are highlighting other columns (B – Item, C – Due date). We need to use $D6 & $C6 (instead of D6, C6) because we want Excel to check Completed & Due date columns. By removing the $ Excel will check relative columns and the conditions would not work! Click here to download example file. Break it apart, play with it to understand the whole highlight if due thing. Note: I use random formulas to generate due dates & completed values. Press F9 to get fresh set of dates. Start typing your own values to remove formulas. How do you handle dead-lines? Do you use conditional formatting to see which items are due? I use conditional formatting for this all the time. What techniques you use? Is your dead-line criteria very different than shown above? Please share your tips & ideas with us using comments. I would love to learn from you. Here are a few useful articles if you use Excel to track to do items & reminders. Christmas shopping list in Excel: conditional formatting to track budgets, bought items etc. Employee shift calendar in Excel: Using dates, shift data to show busy & dull times. Been using something like this for quite a while. Most companies use deadlines so this would be usefulle for everyone. I had the same issue, but I think it was a formatting issue. Copy the formula from this website but delete the "" quotation marks. Type them back in from your own keyboard within the Conditional Formatting dialog boxes. I am still not sure how the MEDIAN function works. When I print the value, it prints a random 5 digit number, But, when used in the formula, it does equate to the date which is weird. Why does it behave such ? =AND(MEDIAN(TODAY()+1,$C6,TODAY()+7)=$C6,$D6<>”Yes”) this seems to work just fine in Conditional formatting. The 5 digit number that you see is the number of days elapsed since 1st Jan 1900 to the date in question. Excel uses this as a basis for all numeric operations on dates. 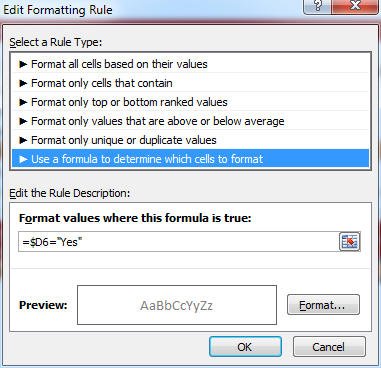 Change the Number format of the cell to DD MMM YY or whatever format you want. Very clever use of Median - wouldn't have thought of using it! "The MEDIAN function, one of Excel's statistical functions, shows you the middle number in a data list. Middle, in this case, refers to arithmetic value rather than the location of the numbers in a list. If there is an even set of numbers, the median is the average of the middle two values. " So, if we give three dates (start date, target date, end date), median will return the middle date of the three. If target date is between the start and end dates, then the median function will return this. If the target date is before the start date, then the median function will return the start date. If the target date is after the end date, then the median function will return the end date. Can you change the dates to only fall on week days? How? Can you please explain more about what you want to do? We have an accounts payable spread sheet that has due dates of bills on it. I would like the dates to only fall on weekdays since we do not work weekends. Thank you for your help. In the above; IF condition will check if weekday of due date is between 1 and 5 ie. 1 being monday and 5 being Friday. Hope i got it right... Chandoo what do u think? How do I have the cell highlight just every 14 days after the date I manually enter in? I contact someone on the 1st and I want the cell to highlight on the 14th and that's it. I wil be adding tasks to the spreadsheet so how can I copy the conditional formatting to other cells in the relevant columns please? Hi Chandoo! Very nice! Can this be done also in Google Spreadsheet? If not can you please show us a workaround or similar. Thank you. i have a formula i need to work out. im more of a novice and enjoy working with excel, however some of the more intense formulas escape me. i have followed this thread quite a bit and believe that i can use this to solve my problem, however i cant seem to grasp the specific verbage of the formula i need. i have 2 colums, one for PT test complet, one for PT test due, i have used a simple format of (=column1+180) to get my due date, what i need is to get the due date to highlight color 1-150 days after green, 151to 180 yellow and 181 days after red. help??? Hi Larry... Thanks for your comments. The simplest way to do this is, add an extra column (lets call it completed). Now, use this column value to color the cells accordingly. im not quite grasping this, can you give me an example? Good stuff! It worked well for me, however, I now wish to apply the same CF to 2 columns, instead of a cell selction. When I do this, all the blank cells in the columns turn red. Is there a formula for "if blank do not format" or similar? The $D1>0 statement means that any blank cells are not formatted. I'm wanting to figure out how i would do this for my job...i need to have orders signed by doctors and i'm wanting it to let me know when two weeks has passed and the order has not been received. I need to make a daily list of jobs with their due dates and then have three different things happening. 2. From one day, before the due date, to 12:00am on the due date the cell colour of the whole row must be orange. 3. After 12:00am on the due date the cell colour of the whole row must be red and stay red untill its ticked off as completed. I'll really appreciate help in this, I've tried several formulas but I just don't get it quite right. I have input all the formulas as the tutorial says but if there is no date put into the field it turns everything red. In other words I am trying to make a template at work with due dates and the orange part works great but everything is red unless I put a date into the cell. Any help would be awesome. If I want to use condtional formatting to indicate a red if the date entered is after June 20, 2014 and a green if it was completed prior to this date, how would I do this with condtional formatting? 2. 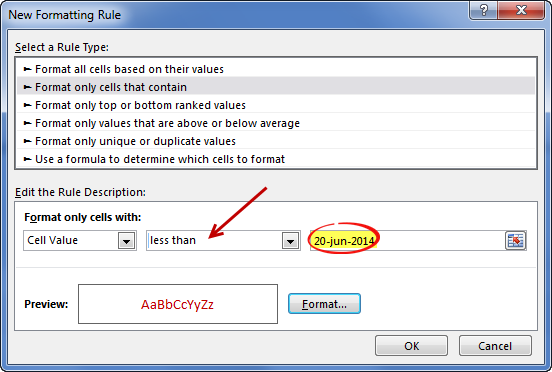 Select the rule type as "Format cells that contain"
4. Set up formatting as needed. 5. Repeat the rules for other date conditions. So if I wanted it to show red if after the due date I would just set up that condition? I have a column of when a person last took a class and a formula that created the date for when they must take it again, which is in three years. Works great. Now I want to color code the current year. For example: I took a class on 9/25/2012 and am due to retake it on 9/25/2015. I want that cell to turn red indicating that sometime during that year, I have to retake that class. I would even prefer to have the date change to JUST the year (so just "2015" instead of "9/25/2015"). Can you help me do this, please? I really appreciate this post, but I'm confused about the MEDIAN. I assume that's what selected the whole line of records rather than just what was in the 2 referenced columns. Why is that so? This might appear to be a silly question, but with the date highlighted when it becomes due/past can you get the cell to flash/blink on and off. I want that Once Due date is highlited with Red color , then it should remain highlighted with Red color on next day or untill i change the colour. Due date is highlited with color but next day it becomes without highlighting. I want it should remain highlited untill i change. I really need help with this formula. Instead of a YES in the next column indicating that the task is complete, I need to enter a date to track our performance. Once a date is in the Completed Column, the date I am tracking would then turn Grey. I understand the due in 7 days and Past Due Formulas. please i need the formula for that, ive been struggling all day. My issue is similar to this. I have one due date for number of tasks and would like to add conditional formatted depending on whether a task is completed or how many days there are until the due date. I have tried a number of formulas and conditional formatting scenarios but have had no luck. Thanks in advance. This is only for 7 days. What if I want it to be exactly 2 months away? Or even 1 year away? Any guidance on this? Sorry im very new to excel. I tried to do a variation on this, we are setting up reminders to follow up on emails. First line of data is row 9. 1. The application form has been received (YES is in 'O9'), therefore 'N9' and 'O9' cells turn white and text grey. 2. If the date in 'N9' is less than 7 days old = Yellow cell. 3. If the date in 'N9' is more than 7 days old = Orange cell. We are setting up reminders to follow up on emails.